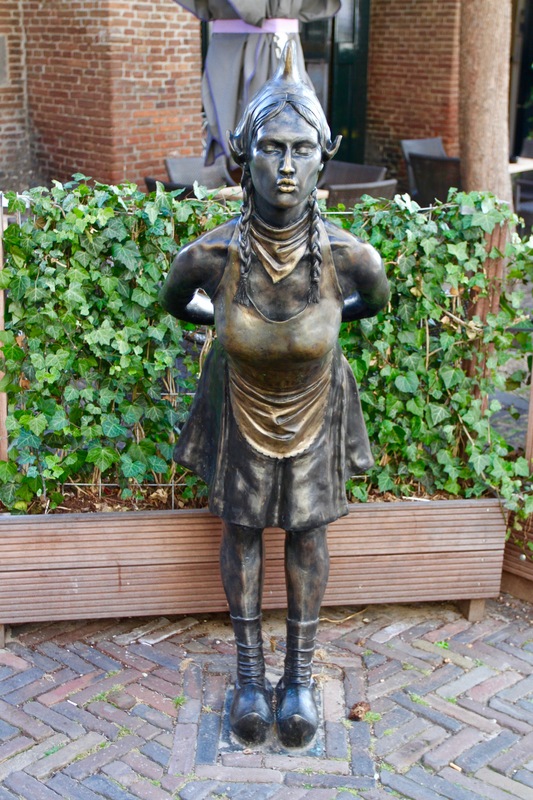 Alkmaar, the cheesiest tourist experience in the Netherlands? 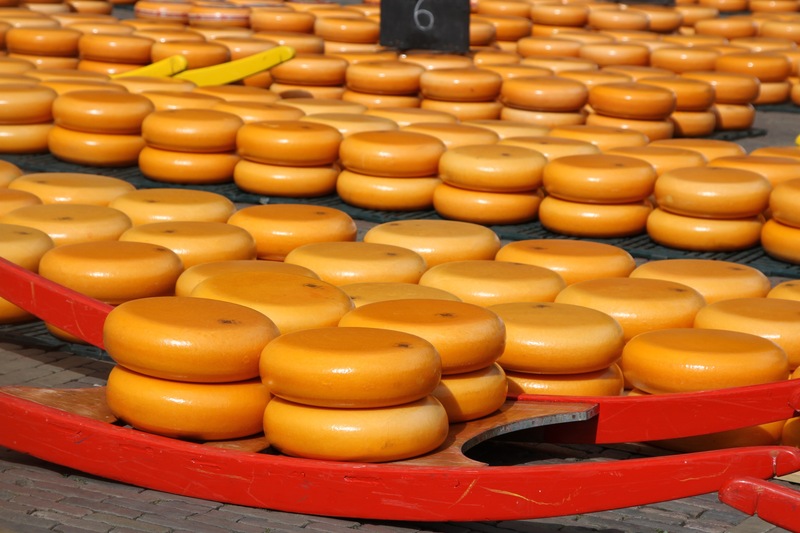 My favourite Dutch cheese anecdote involves Edam, home of the eponymously named round balls of wax-covered rubber masquerading as cheese. In the 17th century, when they were competing with England and France for mastery of the seas, Dutch ships would carry Edam on board. The wax covering kept it fresh for months, and it was used for food or traded for spices in the Far East. In desperate times, balls of Edam were also used as makeshift cannonballs when Dutch ships ran out of ammunition in battle. 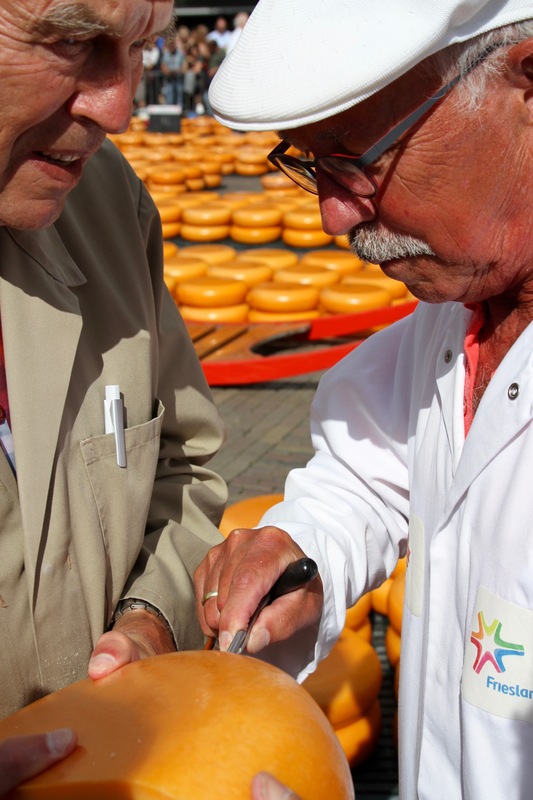 Edam is a small relaxed town, proud of its cheese history, but not consumed by it. The Friday morning cheese market in Alkmaar, less than 30km away, is a very different story. 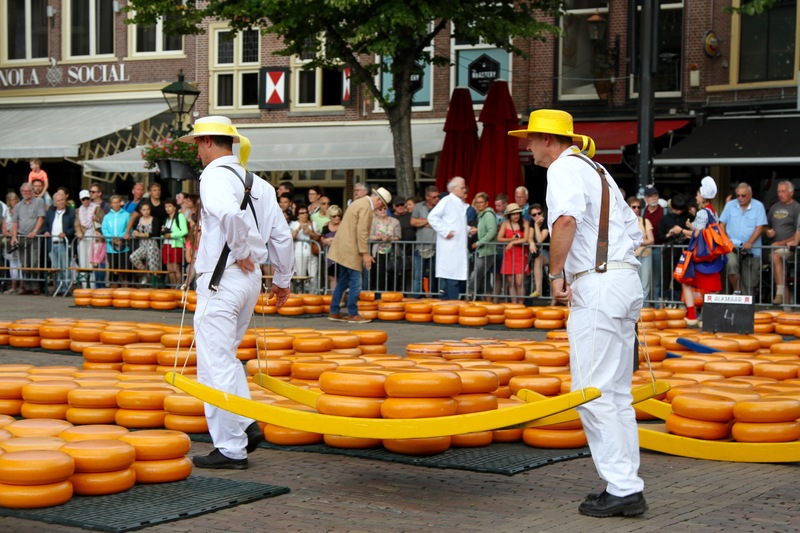 It may be an authentic representation of the cheese market that’s been present in the town’s main square for over four centuries, but it also counts as one of the most touristy things you can do in the Netherlands. It’s almost as if the town descends into an act of collective cheese-related madness for half a day each week. The cheesy experience begins almost as soon as you step off the train. 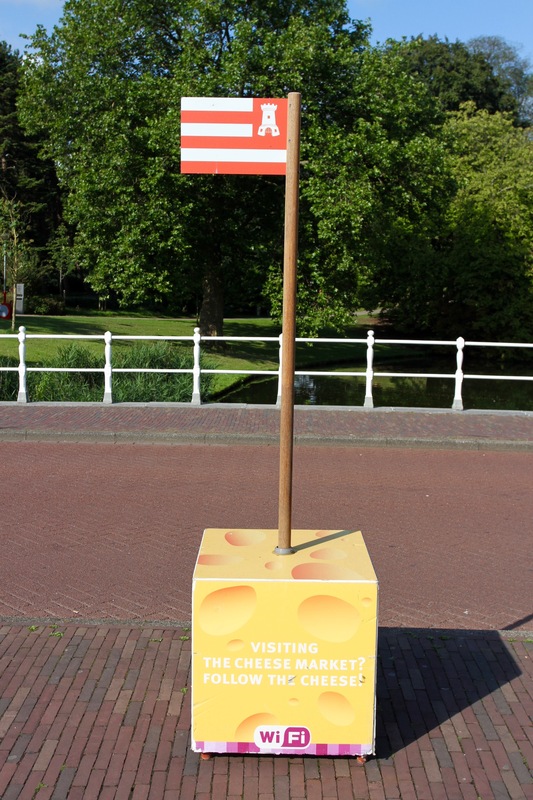 A signpost to the market was embedded in a block of concrete painted to look like cheese. I followed the stream of people heading in that direction, but got a little distracted by some of the town’s incredible historic buildings. This would prove fateful for my chances of getting a good view of the cheese market. When I arrived the seating area was full, and at the barriers the crowds were standing two or three deep. Luckily, most of the tourists weren’t Dutch. The last people you want to stand behind when trying to see something are citizens of the tallest nation on earth. I took up my spot and waited. 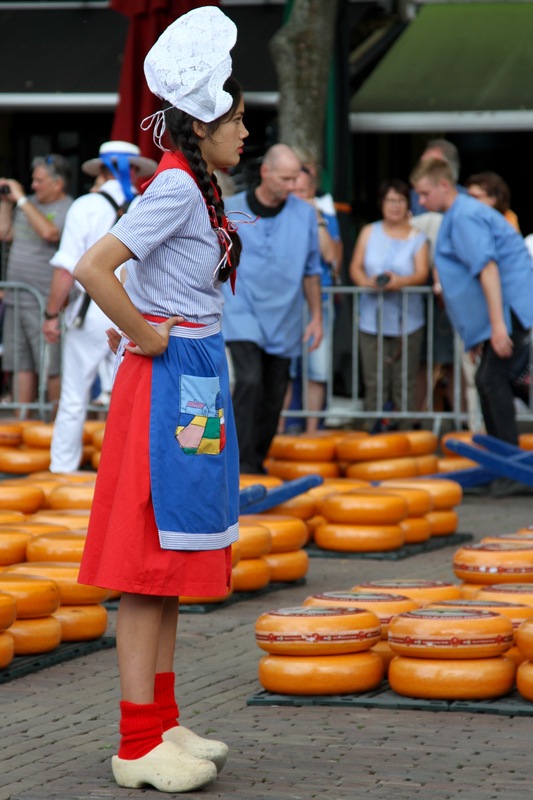 People in traditional costume wandered around placing big rounds of wax-coated Gouda cheese on the floor, until the ancient Waagplein was covered in orange circles. Still nothing happened. Finally it was 10am, someone rang a bell and cheese carriers, cheese tasters, cheese officials and tourist cameras sprang into action. The market was interesting and fun, but it felt a little like being in a cheese circus, everyone performing for the tourists. If it wasn’t for the tourist value that the market brings to Alkmaar, I imagine people would be buying and selling cheese in a modern air conditioned building and not running around under a hot sun in a shadeless square. At least the cheese bearers had cheerful hats to protect them from the sun. Some of us weren’t so lucky. 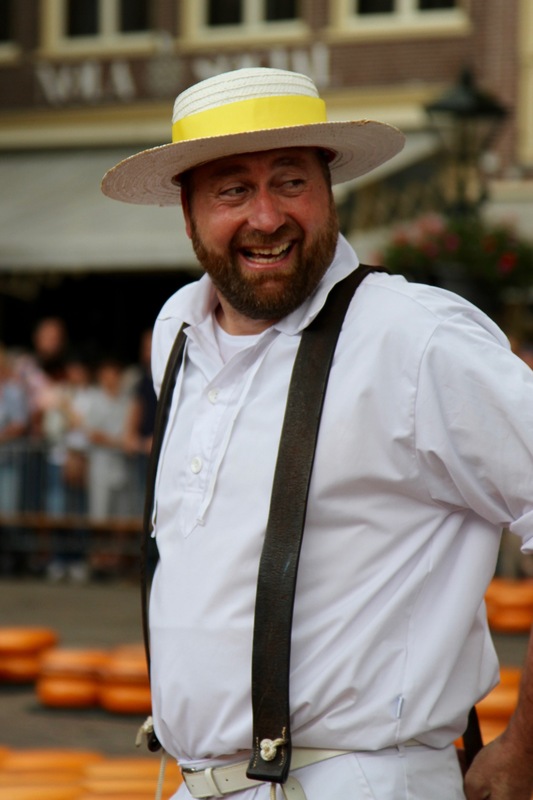 Soon the cheese carriers were in full flow. 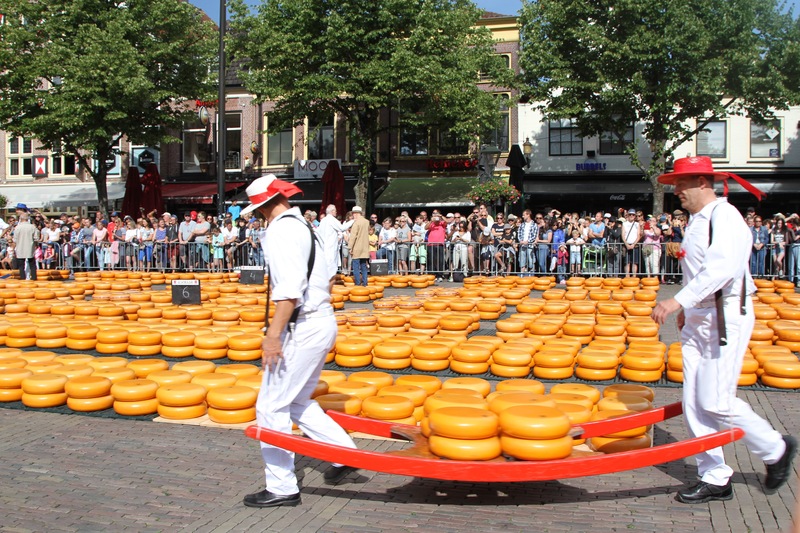 Eight rounds of cheese are loaded onto each wooden barrow, which are then carried by two people on leather straps to be weighed in the Waag building. The shape and weight (120kg) of the barrow give the carriers a peculiar ‘waddle’ as they trot/run with their loads. 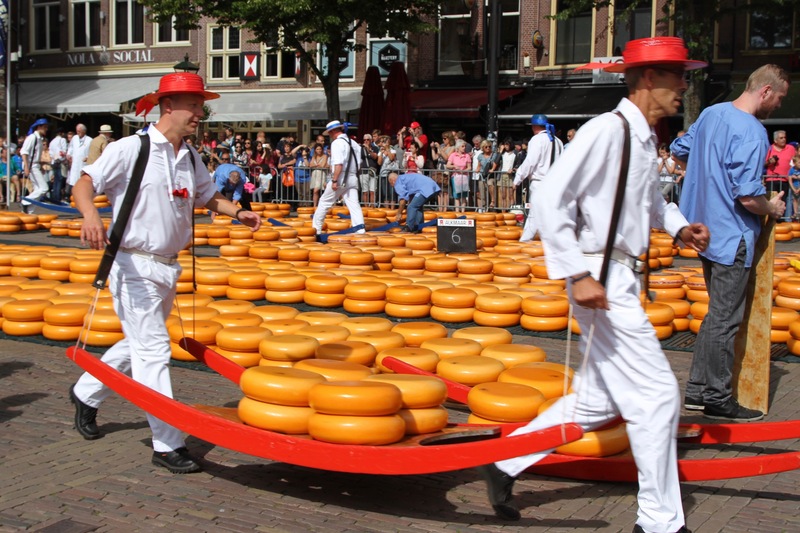 They seem to have a lot of fun in the process, but a few of the cheese carriers looked like they’d eaten one cheese too many. As the hot sun bore down, I began to feel a little concerned for their welfare. 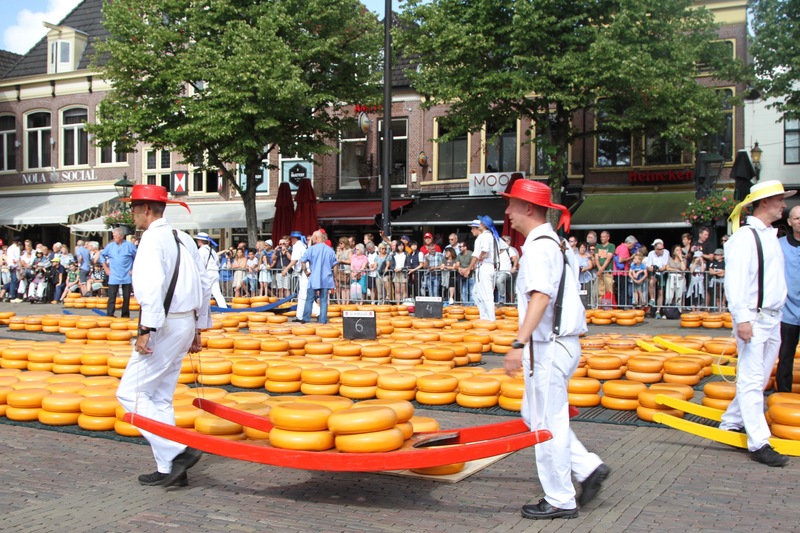 Once weighed, the cheese is ‘sold’ and taken to wheel barrows for transportation out of the square. 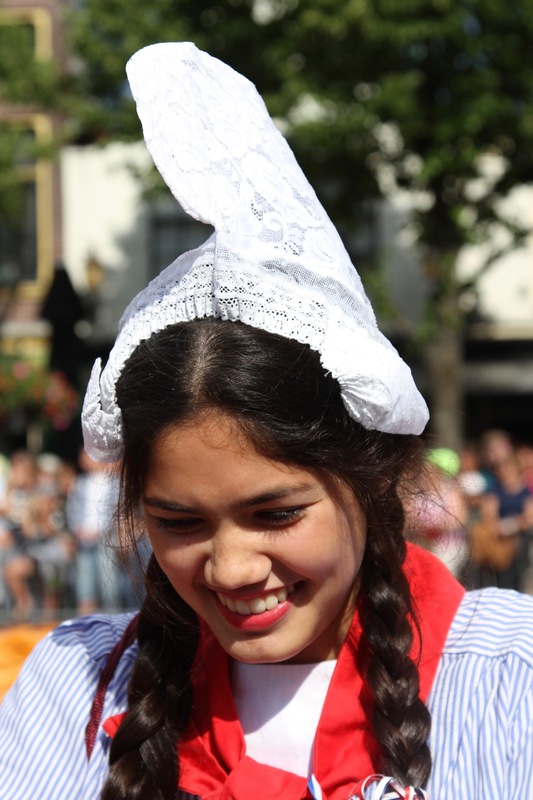 To keep the crowds entertained, cheese tasters come around offering tastings and women dressed in clogs and splendid hats sell their cheesy wares for €10 a bag. All the while, the cheese carriers are running around in the background. The market lasts for two and a half hours, but after an hour I wandered off to explore Alkmaar’s lovely streets. 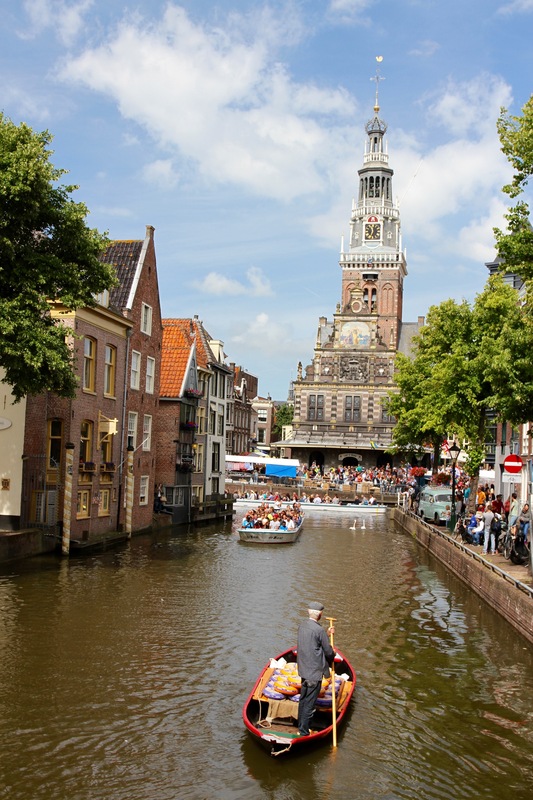 Cheese-related sights can be found around the town, including men punting cheese-filled boats on the town’s canals, and there’s a wealth of history to explore. On a market day though, it’s too crowded to fully enjoy. I decided to come back when there were fewer people. I did pop into the cheese museum, which was small and offered an insight into Dutch cheese making. They give you a plastic-wrapped piece of rubbery cheese that, when eaten, will make you thankful that the French also make cheese. That doesn’t prevent the average Dutch person eating 19kg of the stuff each and every year; or the rest of the world buying 650 million kilos of Dutch cheese annually. There’s no accounting for taste!